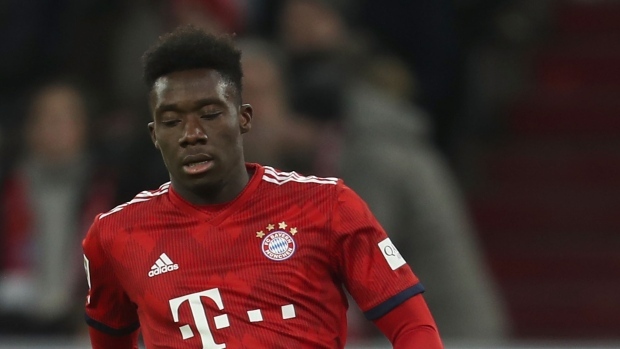 MUNICH — Canadian teenager Alphonso Davies made his Bundesliga debut Sunday, coming off the bench in the 86th minute of Bayern Munich's 4-1 win over VfB Stuttgart. "Great result today....happy to make my Bundesliga debut," Davies tweeted, adding a couple of flexed bicep emojis. "Welcome to your new home," Bayern tweeted. Bayern boss Niko Kovac named an unchanged side from the team that beat Hoffenheim 3-1 nine days ago to mark the Bundesliga's return to action after its traditional winter break. Davies was also on the bench that day and did not see action. Spain's Thiago and Leon Goretzka also scored for Bayern, which also benefited from a Christian Gentner own goal. Anastasios Donis replied for Stuttgart (4-13-2). Bayern went up in the 55th minute after Gnabry's shot deflected off Stuttgart's Gentner and beat goalkeeper Ron-Robert Zieler. It was Stuttgart's fourth own goal of the season. Davies did start in Bayern's penalty shootout win over Borussia Moenchengladbach in the final of the Telekom Cup, a four-team competition held during the winter break. Prior to that, he took part in Bayern's week-long training camp in Doha. He has made nine appearances for Canada with three goals and four assists. In December, he become the youngest winner of the Canadian Men's Soccer Player for the Year Award.